These days everybody knows somebody who has a nostril piercing. It is one of the hottest looks in body modification right now, and every second celebrity seems to be wearing one. Just look at Pink, one of the first celebrities to make the nostril piercing mainstream. Nostril piercings are an awesome and slightly edgy look, while also remaining a bit subtle and mysterious. If you are considering getting a nostril piercing, here you can find everything you need to know for both before and after the procedure, as well as answers to any questions you might have. You can also learn more about the different nose piercings first. Looks awesome, and does not come out unless taken out on purpose. It can be a bit more intrusive than studs, especially when sleeping it can get caught or rub off things while healing, causing discomfort. A nose stud has an L shape, and may even be referred to as an ‘L-Shaped nose ring’. It is a simple design and is inserted through the skin of the nostril. Not as invasive or noticeable as a nose ring, and can be left in place without disturbance as it is not sticking out. Needs a lot more cleaning than other piercings and can heal quite quickly if removed. Much more secure than other piercings as the screw shape keeps it firmly in place. Can be harder to insert into the nose if sensitive, and takes up more space inside your nostril which can be uncomfortable at times. Is not bent or screw shaped, therefore takes up less space in the nose due to its straight design. The ball at the end means you must use a larger gauge than the thickness of the bar, or else it can be difficult to remove. How much will a Nostril Piercing cost? Usually this is the cost of the procedure itself, and does not include the cost of the jewellery as well. However, some piercing studios may throw the jewellery in for free or on discount. However, it is important to remember that cheaper does not always mean better. Make sure you find the right studio to get a nostril piercing, as you don’t want to end up with a botch-job. Shop prices will vary depending on location and popularity of the artist. How long will it take a Nostril Piercing to heal? Nostril piercings may seem to be healed within 2 months, but it is always safer to keep treating it like it is in its healing period for a little longer. Nostril piercings need extra care and attention, as they are notorious for closing over quickly and being infected even after the piercing, has healed. If you take good care of it and have a little patience, there should be no problem at all. How painful is getting a Nostril Piercing? It’s really not that bad at all. There will be a little bit of pain, but not much more than getting an earlobe piercing. Most people tend to have little to no issue with a nostril piercing pain as it is definitely on the lower side of the pain scale. There may be a bit of ache for a few days afterwards, but as long as you stick to proper cleaning and aftercare, there shouldn’t be any serious problems. Can you handle a nostril piercing? Nostril piercings may not be the most painful things in the world, but there will be some discomfort both during the procedure and after. Be sure that you’re ok with this. Nostril piercings really need to be cleaned properly, twice a day for at least 4-6 months. Be sure that you are willing to do this, or you may end up with infections or irritation. Can you be patient with it? It can’t be stressed enough how patient you should be with a nostril piercing. You need to just let it sit and heal, and resist taking it out or changing it during the first few months. Can you resist touching it? You really should not touch it at all. It is going to be hard to not touch your face and nose for a long time, but to save yourself some trouble, you really need to avoid it. Can you think of any reason not to get it? Whether it is work, school, or a medical condition, really make sure it is ok for you to have a nostril piercing. As awesome as we think they are, some people do not agree, and you should make sure it is okay to have them in school or work. There are several stages of getting a nostril piercing. Here is a handy little list which should give you a rough idea of what you’ll be getting yourself into. 1. There’ll be paperwork to fill out when you arrive, to give consent and present ID. 2. You’ll have to pick out some jewellery if you haven’t already. Make sure you like it because you could be wearing it for up to 6 months. 3. You and your piercer will mark the point on your nose you want to have pierced, and the piercer will mark the placement with a surgical marker. 4. The piercer will then insert a sterilised, hollow gauge needle through the marker, followed by the jewellery you picked out. 5. You are now finished! It’s all over in a flash. Your piercer should give you some aftercare tips and you should listen. You can also find them on this page. Infection - Nostril piercings can get infected a bit easier than other body modifications because the nose catches a lot of bacteria during everyday life. You can develop little temporary bumps around the piercing if you catch it on pillows, t-shirts etc. Rejection - After all that time and money spent on a nose piercing, the buildup of bacteria can push the piercing out of your nose. Migration - Similar to rejection, your piercing may be pushed to another part of your nose, which you will, of course, want to avoid. 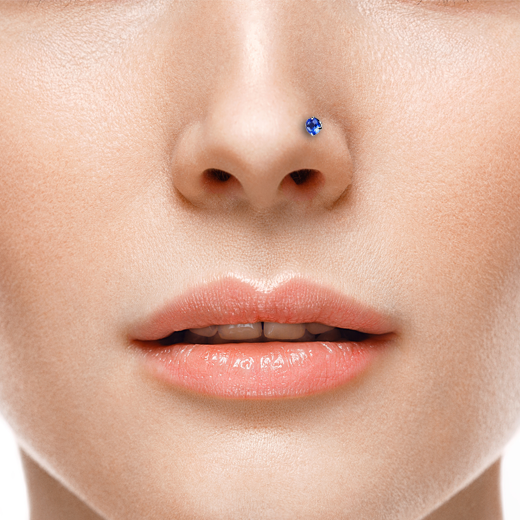 You should really be aware of the best piercing materials before buying a nose piercing. Titanium is always best for first-timers as it is nickel-free and has less risk of developing an infection. This should be the first nostril piercing for everyone. Surgical Steel is good, affordable and looks great, but can also contain trace amounts of nickel which may lead to an allergy or infection. 14 kt. Gold looks great and is perfect for new nose piercings. Make sure that it's solid gold or white gold. Most gold coloured piercings are made of surgical steel and are only gold-plated. Silver is a good choice once your nose piercing is fully healed. Make sure it's real .925 Sterling Silver and that it comes with a rhodium plating. Without, it tarnishes rather quickly. - Use antibacterial soap to thoroughly clean your nose and hands before performing aftercare. - Use one of our fun-sized Salt Spray Solutions up to twice a day for the best results. - Use a thick tissue such as kitchen towel, or a certified swab to apply the solution. - Gently twist your piercing as it is being cleaned so the solution soaks right through. - Don’t wash more than twice a day, and avoid any thick creams or alcohol solutions in the first 2 weeks as they may cause irritation. - With nostril piercings, you should do this for as long as 6 months, even after it has healed, as you don’t want it closing over or getting infected.